Reno, due to its size, location near Lake Tahoe and along Interstate 80, and the number of major casino's in the city, has a wealth of lodging options. Travelers can choose among higher-end resorts such as the Peppermill or the Atlantis. Or they can choose among the normal "non-gambling" hotels, such as the Hampton Inn and other similar type of lodging. 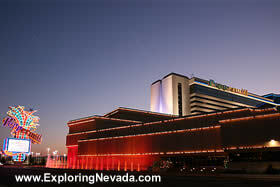 Below are the varoius hotels, casino's and motels in Reno and nearby Sparks, Nevada. Simply click on any of the following to see photos and get more information about each hotel.